Abstract: Because of the high provinciality of the marine biota during the pre-Aptian Cretaceous times, there is no hope of a precise correlation of Tethyan with boreal successions by means of biostratigraphy alone. Correlations with a detail as shown in the correlation schemes presented here, can be achieved only with the combination of all available correlation tools such as biostratigraphy, magnetostratigraphy and sequence stratigraphy. Abstract: A short reverse polarity magnetosubzone, herein defined as the Brodno Subzone, was detected in the upper part of the magnetozone M19n at the locality of Brodno near Zilina (Western Carpathians) using high-resolution magnetostratigraphy. An analogous short reverse polarity magnetosubzone, herein defined as the Kysuca Subzone occurs in the middle part of the magnetozone M20n. Both the magnetosubzones are known from marine profiles but have been detected only sporadically and documented insufficiently in continental outcrops.These two subzones have not yet been detected together in one and the same continental section. Their stratigraphic position in the Brodno section is defined and their interpretation in the other studied section at Stramberk is inferred. In the Brodno section, the Kysuca Subzone represents the basal part of the calpionellid Remanei Subzone of the Crassicollaria Standard Zone (early late Tithionian), its base lies at the level of 55 % of the local thickness of the magnetozone M20n. The Brodno Subzone lies within the calpionellid Alpina Subzone of the Calpionella Standard Zone (earliest Berriasian) and its base in the Brodno section lies at the level of 82 % of the local thickness of the magnetozone M19n. In both the studied sections, the Jurassic/Cretaceous boundary based on calpionellids (base of the Calpionella Standard Zone) lies approximately at the end of the lowermost third of the magnetozone M19n (at the level of 34 % of the local thickness of the magnetozone M19n in the Brodno section). Magnetostratigraphic calibration of calpionellid events proved their isochronous character in the localities of Brodno and Stramberk. The interval of ca. ± 5000 years, during which a transition occurred from normal (reverse) to reverse (normal) polarity of magnetic field of the co-axial geocentric dipole of the Earth, can be determined from an analysis of paleomagnetic directions inferred from samples with intermediate polarity collected from normally and reversely polarized boundary strata at the locality of Brodno and with respect to the sedimentation rate. This value represents the relative accuracy of possible correlations of the boundaries of the detected magnetosubzones with boundaries of analogous subzones at other localities on the Earth using the above given synchronous global event. Abstract: A correlation study was performed on the Upper Turonian foraminiferal assemblage from two localities in NW Bohemia Upohlavy and Brezno and the localities including Dresden-Strehlen in Saxony, Turold in South Moravia and type locality of Klement in Lower Austria. 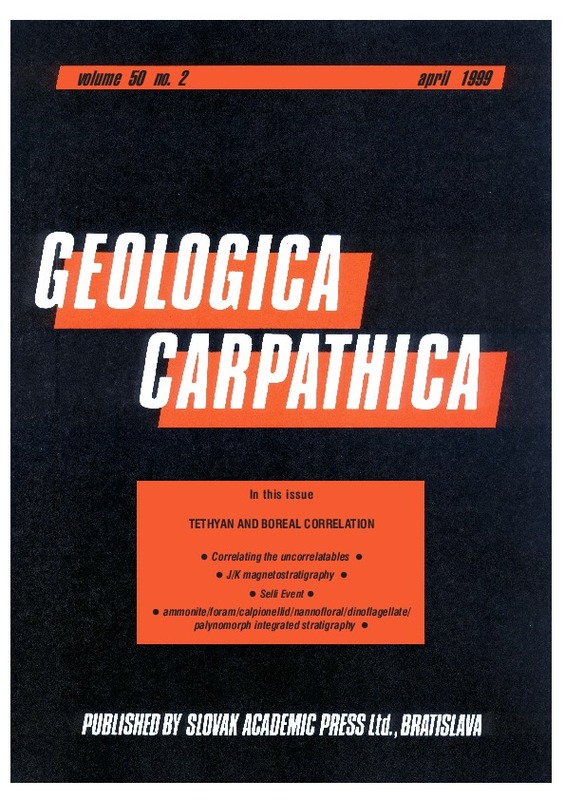 The Upper Turonian sediments (Teplice Formation) from the Upohlavy quarry and the Brezno-Pd 1 borehole contained foraminiferal assemblage represented by abundant, well-preserved tests of agglutinated and calcareous species. Three levels of change of benthic foraminiferal assemblage was recognized in these sediments. The first change - the disappearance of Cassidella tegulata (Reuss), Praebulimina crebra Stemprokova, Gaudryina compressa Akimec and Dorothia pupa (Reuss). At the second change Gaudryina carinata Franke, Gaudryina laevigata Franke, Gavelinella berthelini (Keller) and Pyramidina kelleri (Vasilenko) appeared. The third less significant level is characterized by the disappearance of P. kelleri and G. laevigata. Abstract: This joint study on calpionellids, calcareous nannofossils and calcareous dinocysts of the Tithonian, Berriasian and Valanginian sediments in the Western Balkanides allowed detailed documentation of the stratigraphic ranges and selection of reliable diagnostic bioevents, within the parallel microfossil successions. The individual zonations based on calpionellids, nannofossils and dinocysts are made more precise, refined and directly correlated to each other. The calpionellid zones and subzones recorded in Bulgaria are widely accepted for the Mediterranean. The proposed nannofossil zonation is considered as a regional one for the Western Balkanides. Ten dinocyst zones are recognized three of them being introduced here: Stomiosphaera wanneri, Colomisphaera conferta and Carpistomiosphaera valanginiana. A number of intrinsic coinciding bioevents between two or all the three plankton microfossil groups are documented and interpreted related to certain stage and substage boundaries. This approach of direct correlation of three fossil groups enhances the argumentation and resolution of the zonation. It may represent a basis for a reference biochronology of the Tithonian to Valanginian, applicable to various lithologies in the Tethyan Realm. Abstract: Orbital perturbations of Barremian/Aptian climate traceable by sedimentological, biological and chemical proxies have been studied in Mt. Rochovica (Western Carpathians, Pieniny Klippen Belt) sedimentary sequence. This pelagic carbonate sequence represents a record of sedimentation on a distal edge of the Paleoeuropean shelf. Pelagic carbonate deposition was influenced by clastic input from the elevated Czorsztyn Ridge (microbreccia of Tithonian/Berriasian limestones) and by fluxoturbidites derived from unknown carbonate buildups. Interruption of carbonate deposition by the terrigeneous Konhora Formation has been interpreted as a consequence of a humid event in the initial stage of the mid-Cretaceous Greenhouse climate. Three anoxia models (depositional, productivity and stagnant one) have been distinguished in the depositionary regime. Abstract: About twenty ammonite species of Turonian age were determined from several sections in North-East Bulgaria. Six of them–Subprionocyclus hitchinensis, Mesopuzosia beloensis, Tongoboryoceras donovani, Tongoboryoceras rhodanicum, Gaudryceras denseplicatum and Anagaudryceras sacya were found for the first time in Bulgaria. The three Turonian substages are biostratigraphically proven. Three „standard ammonite zones“ (uppermost Early Turonian–Mammites nodosoides Zone, Middle Turonian–Collignoniceras woollgari Zone and Late Turonian–Subprionocyclus neptuni Zone) are established. The lower-middle and middle-upper Turonian boundaries are estimated by ammonites. Abstract: The oldest micro- and nannofossils of the ?Tithonian Lower Cieszyn Shales and detrital Cieszyn Limestones are dominated by redeposited calcareous benthic foraminifera and calcareous nannoplankton. These assemblages are similar to those of epicontinental seas or large shelf areas. The younger micro- and nannofossil pelitic part of the Berriasian Cieszyn Limestones and Valanginian Upper Cieszyn Shales are composed of low-diversity primitive agglutinated foraminiferids and calcareous nannoplankton that resemble coeval faunas and floras of the Tethys seas. The sequence of foraminiferal assemblages and the nature of the nannoplankton associations from the "Cieszyn Beds" reflect the subsidence or collapse of the NE European Platform margin, disappearance of shallow areas with carbonate sedimentation, and formation of a deep basin with turbidite sedimentation. These events may be related to the Neocimmerian orogeny and the worldwide regression at the Tithonian/Berriasian boundary.